Kenya's government has asked the UN Security Council to halt the trials of President Uhuru Kenyatta and his deputy at the International Criminal Court. The newly elected leaders deny allegations of orchestrating violence after the disputed 2007 election. The letter, sent last week, says the prosecutions are "neither impartial nor independent" and could destabilise Kenya. The UN Security Council is able to defer ICC cases for up to 12 months. The deferral can be renewed indefinitely, but the Security Council cannot order the court to drop a case. 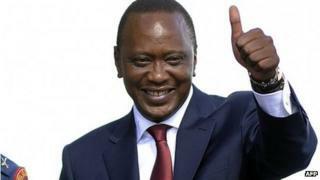 Mr Kenyatta, who won presidential elections in March with 50.07% of the vote, is due to appear at the ICC in July for his trial on charges of crimes against humanity. The trial of his deputy, William Ruto, who faces similar charges, was due to begin this month but it has been postponed. A new date has yet to be agreed. The men were on opposite sides in the 2007 election, after which some 1,000 people were killed and 600,000 people fled their homes. Analysts say the ICC prosecutions bolstered their campaign in the 2013 poll, as they presented it as foreign interference in Kenya's domestic affairs. The Kenyan petition, which was stamped "confidential", was sent to the UN Security Council ahead of a briefing by the ICC prosecutor Fatou Bensouda on Tuesday. "What this delegation is asking for is the immediate termination of the case at The Hague without much further ado," says a copy of the document seen by the BBC and signed by Macharia Kamau, Kenya's UN ambassador, on 2 May 2013. Mr Kamau assured the Security Council that Kenya would continue to co-operate with the ICC, as it had signed the Rome Treaty that set up the court. But his letter appealed to the UN Security Council (UNSC) to urge the court to respect Kenya's sovereignty and drop the cases. "We are of the opinion that the UNSC must play its role and bring this matter to a halt, if the purpose for which the Rome Statue was negotiated is to be achieved." The petition described Mr Kenyatta and Mr Ruto as the "glue" that bound "the country during the elections and transition period". Kenyans had acted with "a loud, clear and concise voice when they overwhelmingly elected them", it said. "It is obvious that their absence from the country may undermine the prevailing peace and any resultant insecurity may spill over to the neighbouring countries. "A lot has changed in the last two and a half years; we submit that Kenya has the capacity to offer a home-grown solution." After Kenya repeatedly failed to prosecute those accused of organising the post-election violence, the ICC originally charged six people but charges against two were not confirmed. The case against Mr Kenyatta's co-accused Francis Muthaura was dropped in March, leading the president's lawyer to ask for his charges to also be set aside. The ICC chief prosecutor has accused the Kenyan authorities of failing to co-operate with the case and said some witnesses have been intimidated. The court's proceedings so far showed that the Kenyan case was "falling apart in the face of a lack of evidence, withdrawal of witnesses and incompetent prosecution", Mr Kamau's petition said. The names of key suspects involved in violence after the 2007 election were handed over to the ICC by Kofi Annan, who brokered a power-sharing deal. He did so after Kenyan politicians failed to set up a tribunal as promised to try those accused of instigating the violence.